Udupi, July 9, 2015 : A press release issued by the Department of Mines and Geology here said that the State Environment Impact Assessment Authority (SEIAA) had left it to the Udupi DC to take a decision on allowing sand extraction, if it did not affect the breeding of fish in the Coastal Regulation Zone (CRZ) areas during the monsoon. The district administration decided to allow sand extraction in Udupi district from July 16 onwards, provided there are no valid objections. Consequently, the CRZ Sand Monitoring Committee at its meeting here on July 7 decided to allow to allow sand extraction in the district from July 16. But it has allowed people to submit their objections, if any, to the move to allow sand extraction in the district. 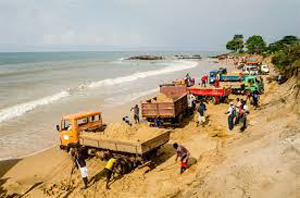 If anyone had objections to sand extraction during the monsoon or objected to it on the grounds that it affected breeding of fish in CRZ areas, they could submit them to the Deputy Commissioner by July 15. Udupi DC Dr. R. Vishal told media July 8, that already there was a ban on fishing by mechanised boats in the district from June 1 to July 31. This was also the period during which sand extraction was banned. These measures were aimed at protecting breeding of fish. According to some persons, the sand bars were not in areas in which the breeding of fish took place. If any person or organisation has valid objections to this decision, they are free to submit and it will considered . Geologist in the Department of Mines and Geology, said that if there were any objections, it would be taken up in the next meeting of the CRZ Sand Monitoring Committee.